could be so much fun. The 2016 Winter Festival concludes with a duel. You have heard of “Dueling Banjos?” Well tonight we have dueling quartets. Festival artists, Brittany Boulding (violin), Alistair MacRae (cello), Maria Sampen (violin) and Timothy Christie (viola) are joined by special guest artists, PRISM Quartet for a wild exploration of music for string and saxophone quartets respectively. The two quartets will also join forces for a performance of Seattle-born composer, Paul Chihara’s, Forever Escher. The title takes inspiration from the graphic artist, M.C. Escher, whose prints adorn the dorm room of many an undergraduate. We are all familiar with the images of stairs leading to impossible dimensions or the pair of hands simultaneously drawing themselves in 2- and 3-D. The Escher of this work, however, explores the concept of metamorphosis, specifically in his 1940 work, Metamorphosis II. The work can be viewed here. We will explore this concept sonically through music of Mendelssohn, Chihara and beyond. PRISM Quartet will take the stage alone to bring the 2016 Winter Festival to a stunning conclusion. Happy New Year, indeed! Artists: Brittany Boulding, violin; Timothy Christie, viola; Matthew Levy, tenor saxophone; Alistair MacRae, cello; Timothy McAllister, soprano saxophone; Maria Sampen, violin; Zach Shemon, alto saxophone; and Taimur Sullivan, baritone saxophone. 1827 was an important year in music. It is the year in which Beethoven died, leaving a legacy that would both intimidate and inspire composers such as Schumann and Brahms for the remainder of the 19th Century. Beethoven spent his final productive days working almost exclusively in the medium of the string quartet. The so-called “Late Quartets” remain the pinnacle of the quartet repertoire to this day. Deeply personal statements, the Late Quartets give us a window into the agonies, reconciliations and revelations of Beethoven at the end of his life. His peers thought the works to be no more than the incoherent ravings of a deaf and swiftly deteriorating artist. However, one composer devoured these works and studied them with zealous devotion. That composer was none other than the 18 year-old, Felix Mendelssohn. Fans of the annual WWCMF Collage concert in June will note that Mendelssohn’s self-quotation of Frage in this quartet provided the thematic framework for the 2013 edition of Collage. Finally, you will have closure as we explore the whole quartet in all its glory! Foundry Vineyards provides the perfect setting in which to discover delicious wines and to consider Mendelssohn’s early masterpiece. and ask the moonlight and the little stars about me? and who will stay forever true to me. Artists: Brittany Boulding, violin; Timothy Christie, viola; Alistair MacRae, cello; and Maria Sampen, violin. Could there possibly be a more perfect chamber ensemble than the String Quartet? Elegant, light-weight and portable, capable of ascending monumental heights and plumbing the most profoundly expressive depths in music, the string quartet is unmatched… At least, it used to be. There is a new sheriff in town. This is the dirty little secret that string players the world over do not want you to know about. The most perfectly matched ensemble, hands down, is actually… wait for it… the Saxophone Quartet. Tonight, WWCMF comes clean and presents one of the world’s greatest examples, PRISM Quartet. Many of us think of jazz as the natural habitat of the saxophone, or perhaps the office, backlit by flickering neon, of a washed up private investigator just as a mysterious and beautiful woman enters. Well, that’s just part of the story. The saxophone enjoys a rich classical tradition, and its place in the medium of chamber music is undeniable. Tonight you are in for a treat. PRISM Quartet has performed all over the world to universal acclaim. Its members are leading performers and teachers who can be heard soloing with the world’s great symphony orchestras, and on countless recordings. The hip Tasting Room at Charles Smith Wines provides the perfect setting to get to know this incredible ensemble. As for the string players, we’ll be there, too… taking notes. Artists: Matthew Levy, tenor saxophone; Timothy McAllister, soprano saxophone; Zach Shemon, alto saxophone; and Taimur Sullivan, baritone saxophone. Presented by Walla Walla Community College Arts and Sciences and the Walla Walla Community College Foundation. Do you know how to compose music? Yes, you do! You just might not know it yet. Here’s a perfect opportunity to channel your inner Beethoven, and you needn’t go deaf in the process. 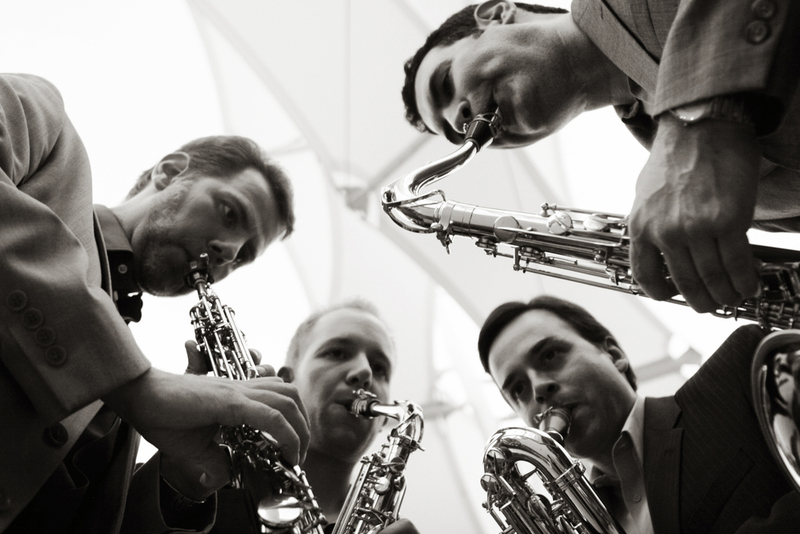 PRISM Quartet will lead an exploration of sound, and in particular, the medium of saxophone quartet. You will have an opportunity to create new music using notation and in some cases, to have your magnum opus premiered by PRISM Quartet. All it takes is an open mind and a little curiosity. This event will run approximately 90 minutes. The 2016 Winter Festival kicks off with a Portrait of an Artist event featuring the dynamic cellist, Alistair MacRae. Alistair has diverse musical interests, equally at home in the world’s great venues such as Carnegie Hall or onstage with heavy metal heroes, Scorpions. Main Street Studios provides the stage on this night. While this evening’s program will skew towards solo cello music by Bach and Cassadó, Alistair will surely “Rock You Like A Hurricane.” Here he is! Festival Artists Maria Sampen, Brittany Boulding, Alistair MacRae, Timothy Christie and world-renowned PRISM Quartet combine to present a fun performance of music for strings and saxophones. Saxophones are kind of hard to classify. They're called part of the woodwind family, but they are made out of brass. There is one important piece of wood, though: the reed. We’ll explore sound, rhythm and how classical music’s hardest working musicians get so good at playing. The performance and presentation will run approximately 45 minutes.